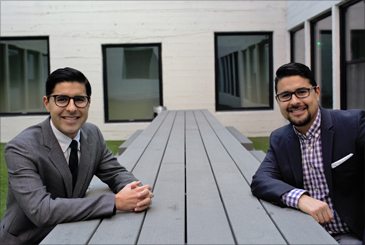 Twin brothers Kenny (left) and Sean Salas, who started Camino Financial in graduate school two years ago, remember when their family’s business collapsed because of unmet financing needs. It would be easy to typecast Sean and Kenny Salas as young entrepreneurs who think their new high-tech venture can do well by doing good. But the motivation behind Camino Financial , a Los Angeles-based online marketplace that seeks to connect underserved Latino small businesses with online lenders, runs deeper than the average business plan. When the twin brothers were 12 years old, their mother lost her business — a chain of restaurants that she had run in Southern California for 25 years — because of a lack of needed financing and other problems. Their parents took the brothers back to their hometown in Mexico to start over. The brothers ultimately overcame that life setback, but it instilled in them a strong appreciation for the target market they are trying to serve today. “We are giving [lenders] access to the underbanked Latino business market, and that’s a huge value because it’s the largest and fastest-growing underbanked business segment in the United States,” said Sean Salas, who is scheduled to speak Thursday at American Banker’s Small-Business Banking conference in Palm Beach Gardens, Fla. Indeed, Hispanic businesses’ growth rate has been 2.5 times that of all U.S. firms since 2012, and they are expected to contribute about $668 billion in revenue to the national economy in 2016, according to a report this year by Geoscape, a research firm that focuses on Latino commerce. Camino aims to provide access to loans to businesses that have been operating for at least a year, earn a minimum monthly revenue of $5,000 and are without credit delinquencies 24 months before applying for credit. Its current focus is on loans with terms of one to five years and with a price range of 5.49% to 24.99%. “We are targeting the Latino market that is currently getting mainly served by merchant cash advance providers” who are charging interest rates of 30% or above, Kenny Salas said. The company had raised $2.75 million of capital as of August and attracted 2,000 small-business owners to apply for loans on their platform that are offered by 14 participating online lenders. Camino is on the verge of announcing a partnership with a community bank, the brothers said. One of Camino’s roles is to provide its own credit analyses of the loan candidates. That work has occurred over several years and is more than their quick stab at a hot trend, the brothers said. Several years after the family business folded, Sean and Kenny, then 20 years old, returned to the U.S. with two bus tickets and their laptops after getting scholarships from the University of California, Berkeley. They both obtained BAs in the political economy of industrial societies. They became actively involved in Latino-oriented student organizations and other nonprofit organizations in school. “We began to identify what it meant to be Latino,” Kenny Salas said. And that can carry a wide range of realizations with it. “It does have racial polarization,” he said. An internship program offered by Sponsors for Educational Opportunity — a nonprofit organization working to help minority students — gave the two talented brothers the chance to work on Wall Street. Sean worked at UBS and later ICV Partners, a New York City-based private-equity firm. And Kenny worked at Barclays Capital and then at Palladium Equity Partners, a private-equity company with a focus on investing in the U.S. Hispanic market. They then attended Harvard Business School from 2013 to 2015. Sean came up with the idea of starting Camino Financial and launched a test product in July 2014, the summer after his second semester at the school. Kenny and their older sister, Yvette Salas, joined the effort, and the brothers leveraged their business school connections to consult with alumni and build the team. During two years of refining their business model, Camino’s founders have sought out clients, assessing the credit of the clients using their own credit-scoring algorithm. The brothers, now 32 years old, stressed that they are doing good for the Latino business owners by not only offering them loans that they cannot get, or easily get, from traditional banks, but also by providing them free financial consulting services and education through partnerships with nonprofit entities and small-businesses development centers. “[Big banks’] internal processes are not set up to efficiently underwrite loans below $150,000,” Sean Salas said. And bank asset consolidation reduces the number of community banks which are oftentimes the main lenders to small businesses, according to a Harvard Business School study in 2014 about how technology could lower barriers to small-business lending. Camino touts that its customers can get up to $500,000 as fast as four days after applying for a loan on its website and consulting with a financial expert. It charges a fee of 2% to 3% of the loan — but the Salas brothers refused to call it a commission. “The actual entity paying the fee is essentially the lender we work with, and they are essentially sharing the origination fee that they already charged the client,” Sean Salas said. And it faces plenty of competition despite its niche orientation, Riley said. “It does address the Latino community, and it has an interesting management team,” but it is not unique, he said. The past decade has witnessed a number of online lenders and intermediaries that target small businesses, and their business models are more mature. OnDeck Capital, founded in 2007, is publicly traded, has operations in the U.S., Canada and Australia, and has made $4 billion of loans to more than 40,000 small-businesses owners. Biz2Credit has arranged more than $1.5 billion in small-business funding. Lendio has been in the business more than 10 years, Fundera has gained a lot of attention for its Borrower’s Bill of Rights to enhance transparency of online lenders, and MultiFunding is partnering with cooperating community banks to provide loans. The Salas brothers said they will announce a partnership with a community bank this month, and they hope it will give Camino a large allocation of capital to deploy using its second-generation credit scoring algorithm. Under that model, Camino receives the full origination fee from the borrowers, and the community bank also gives service fees to Camino based on the performance of the loan. The bank gets to keep what it collects minus those fees. Their goal is to originate at least $1 billion in the next five to seven years, and they predict the market opportunity for small businesses seeking alternative loans is $6.8 billion. At the small-business conference, Sean Salas plans to discuss the great potential of the Latino market and also how community banks can partner with fintech companies such as Camino as well as the challenges along the way.